The new Ninja 2 from Atomos captures Apple ProRes and AVID DNxHD recording from HDMI cameras for less than $300. The monitor-recorder allows any HD camera to record to a pro format. It avoids the internal MPEG compression. Your output goes from less than 30Mbps MPEG to 220Mbps. This is ready to edit 10-bit 4:2:2 Apple ProRes HQ & Avid DNxHD 220 footage. Recording straight out from the sensor means no more 29.59 minute record limits on your internal recordings. Record to standard 2.5” hard drives (HDD) and solid state drives (SSD). A $50 1 TB drive will give you more than 10 hours of Apple ProRes HQ. You choose the drive. HD off the camera sensor is edit friendly 4:2:2 10-bit Apple ProRes. 4:2:2 for improved color accuracy and 10-bit for the extended color depth demanded in post production. Ideal for quality green screen and other keying work. The Ninja 2 monitors up to 2 channel digital and 2 channel analog audio all locked frame accurately, with no drifting. Their more expensive Ninja Assassin does 4K recording. 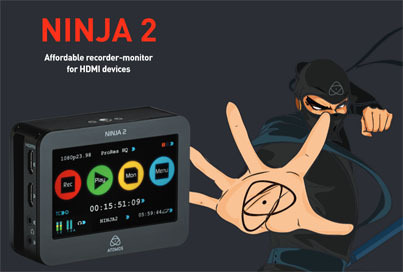 For more information about the Ninja2 see Atomos Ninja2.